Dungeon Brewmaster is an early access virtual reality game available on HTC Vive and Oculus Rift. It’s a clever riff on the job simulator genre that tasks players with concocting potions and poisons to satisfy the clientele of a working dungeon. The big idea: Players slip on their virtual reality headsets and step into the shoes of a magical bartender surrounded by tables and shelves featuring exotic ingredients. 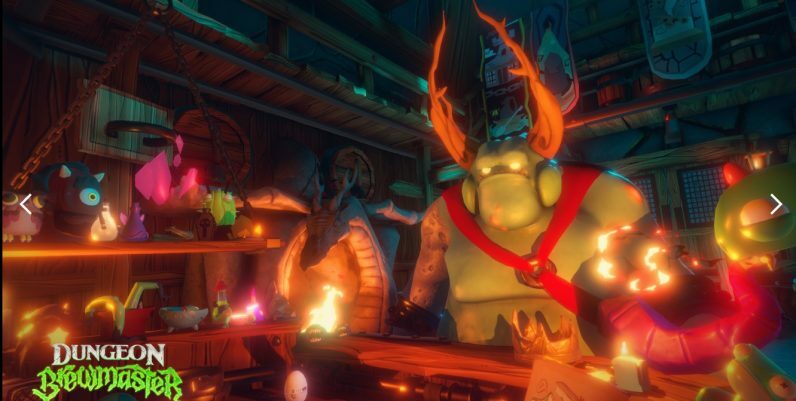 Through the course of the game’s story mode, customers will queue up to order unusual concoctions which the player must then create. Gameplay unfolds through the use of gestures and movement. Players will, for example, hold a wriggly worm creature in one hand and slice its head off using a virtual knife or pour the contents of a liquid vial into a simmering pan. It’s all very intuitive and there wasn’t any learning curve in figuring out how to interact with the tools and ingredients at hand. Go deeper: As the game’s story plays out the requests become increasingly complex, and despite the relative simplicity of the genre (make stuff, sell stuff, make more stuff), I found myself engrossed in the process. This is in no small part due to the top-notch voice acting and perfectly paced story. I never felt like I was being dragged along on a ride as a passive passenger and the creatures I interacted with seemed as alive as any I’ve interacted with in VR. Graphically, it’s one of the most polished VR titles I’ve seen, especially considering it’s still in early access. The ‘tavern within a dungeon’ concept works nicely and it looks great. Character and item models are well done and the cartoon aesthetic really lends to the immersion. The game also has a sandbox mode where players can experiment with their own recipes and unlock items for use in story mode. The bottom line: If you’re a fan of the job simulator genre – featuring games such as Job Simulator and Prison Boss – this is definitely a game you should check out. The repetitive gameplay and lack of diverse locations may turn off some gamers, but the graphics and story make it a worthwhile experience overall. You can check out the game now, in early access, on Oculus Rift or HTC Vive. It’s available on Steam for $14.99.